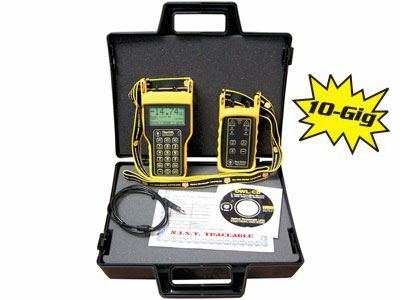 Fiber OWL test kits are ideal for the fiber optic professional who requires standards-based certification of fiber links, including TIA-568, ISO 11801, various Ethernet standards, among others. The Fiber OWL can also be configured with custom standards to meet the needs of various fiber optic applications. Fiber OWL 4 kits are now 10-Gigabit Ethernet ready. This new update allows fiber optic professionals to certify their fiber links for 10-Gigabit Ethernet, the next generation of fiber network. Each Fiber OWL test kit comes with a N.I.S.T. Traceable Fiber OWL optical power meter one or more complementary fiber optic light sources, based upon your application. Many configurations are available. Included with each test kit are a hard-shell carrying case, protective rubber boots, carrying straps, 9-volt batteries, certificate of NIST-traceability, and a CD-ROM with free OWL Reporter software and operation manual. Fiber OWL 4 BOLT Series Test Kits use Dual OWL MM sources and/or Laser OWL SM sources to give installers a full-featured certification option for their multimode and/or singlemode fiber links at economical prices.